Jennifer Flores had headaches before, but this was different. She’d never experienced that kind of pain. When it hit, she began to scream. Anthony, 10, the eldest of Flores’ six kids, heard the screams. Flores would often playfully scare him and his siblings and chase them around for fun. But Anthony could tell she wasn’t playing. He called 911. The last thing Flores, 28, of Greeley, remembered was fighting with EMS about who was going to watch her kids as they brought her into the ambulance. She woke up at Swedish Medical Center in Denver. She’d had five brain aneurysms. 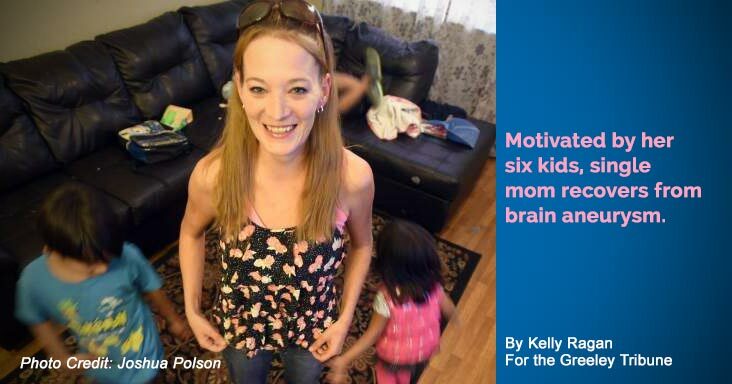 When she woke up, she had no idea she was married or that she had six kids. She’d recognize their faces when they came to visit, but as soon as they left, she couldn’t remember them. Her youngest daughter was a year-and-a-half old then. A brain aneurysm is a bulge or ballooning in a blood vessel in the brain, according to the Mayo Clinic’s website. It can leak or rupture, which causes a hemorrhagic stroke. Leaks can cause sudden, severe headaches, often followed by a rupture. Ruptures can cause sudden, extremely severe headaches, nausea and vomiting, stiff neck, blurred or double vision, sensitivity to light, seizures, drooping eye lids, loss of consciousness and confusion. After about two weeks at Swedish Medical Center, Flores transferred to the Northern Colorado Rehabilitation Hospital, 4401 Union St. in Johnstown, where she started her recovery. And even though she couldn’t remember them at first, her kids became her reason to get better. When she first started, she couldn’t lift more than five pounds. When she got frustrated at the gym, her therapists would remind her why she was working so hard. Therapists had her plan birthday parties. They asked her what meals she’d cook her kids. Flores had to list out the ingredients. They even took her to the store and let her pick out the groceries and cook her famous lasagna. She missed a couple ingredients that time, but it was a big step. She got discharged from the rehabilitation hospital after 11 days. Her life continued to change. She had to participate in outpatient physical therapy for about a year. She and her husband got a divorce. She had to return to the workforce after her stroke and after years of being a stay-at-home mom. Now 30, Flores and her ex-husband remain friends. The kids split their time between the two. She just graduated with an associate’s degree from Aims Community College. She’s mostly back to normal now, though sometimes she has difficulty sleeping or sleeps too much. She hopes to be a nurse someday.